I've crunched KenPom rankings and studied three-point shooting percentages. Didn't work. I've gone with Mascot Fight Club,* Celebrity Alumni,** School Slogan Showdown*** and If This School Was a Beer, Would I Drink It? **** to make my picks. Still crapped out. Over the last two decades, I've tried everything save consulting a psychic and copying President Obama's brackets -- Kansas in 2010? Really? -- to win various NCAA tournament pools. And save a single, glorious second-place finish in the early Aughts, I've come up short. The problem? I was trying in the first place. A few years ago, I struck up an occasional email correspondence with Ed Hirt, a sports-minded psychology professor at Indiana University. We've chatted about many things, from psychopaths in sports to the mental makeup of fans. (Note: two subjects that might be related). In 2010, Hirt shared with me a paper he co-authored, one that explained why my brackets always go bust. Turns out I should have been picking chalk. 2. People can't help but pick too many upsets, via a phenomenon known as probability matching. "The bottom line is that we think we can do better than the seedings," says Ed Hirt, one of the study's authors and a professor in Indiana's department of psychological and brain sciences. "We know more and can figure out who is hot, who is overconfident or a choker in the tournament. But all the information we have is likely already accounted for in the seedings anyway, so our illusory belief that we can do better actually hurts our performance." First, the numbers: Looking at the average performance of individuals in the 2004 and 2005 ESPN.com Tournament Challenge, the study found that participants were 75.2 percent correct in '04 (72.9 percent in '05), while going chalk would have resulted in being 87.5 percent correct in '04 (75.0 percent in '05). If NCAA tournament upsets are essentially random, then why the insistence on making lousy picks? Hirt attributes much of it to probability matching, which in the context of the NCAA tournament basically means that individuals are aware that certain upsets seem to happen regularly and ill-advisedly make picks accordingly. Take the 5-12 games: Most people feel compelled to pick one upset -- it happens every year! -- even though they'd be statistically better off to select the four favorites. "The best analogy I can make is a student who has to guess at the end of a multiple-choice test where they weren't able to get to all the items," Hirt says. "Your best bet is to guess the same response for all the rest, so that you get at least some of them right. "However, people may think that the teacher tends to have certain probabilities of answers being correct. You think your teacher has a 20 percent A, 20 percent B, 40 percent C and 20 percent D, so if you have 10 blank ones, you guess two A, two B, four C, and two D. By doing so, you may get none of them right -- but if you put C all the time, you would get four correct. That's how I think of it." And that, in turn, brings up another good reason to go chalk: It's less of a headache. * Which school’s mascot would win in a street brawl, and/or on Animal Planet? In legal circles, this is known as Mongoose v. Cobra. ** A school is only as solid as the distinguished alumni it produces. Basketball is no different. There's a reason Kansas (Don Johnson) is a perennial contender while Arizona (Craig T. Nelson, Geraldo) is widely predicted to be a first-round upset loser. *** Since intercollegiate athletics exist primarily as a marketing tool -- what, you think rich alums get pumped up to donate because some genius professor won a Nobel Prize? 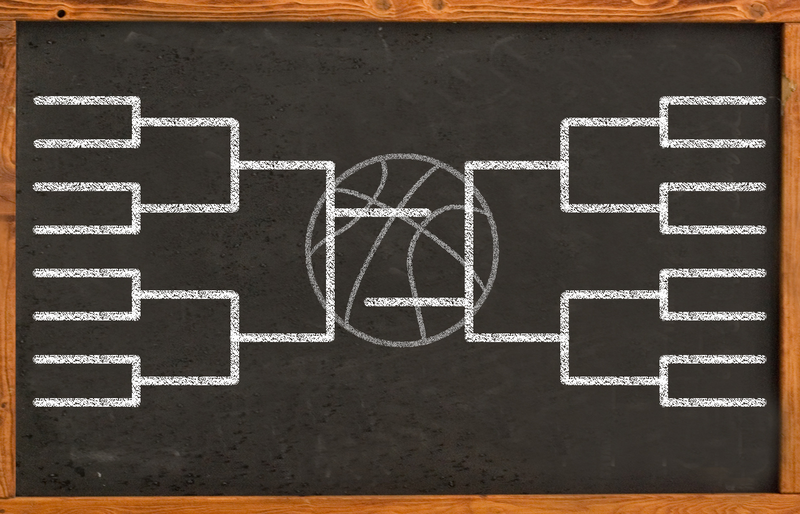 -- why not pick your brackets accordingly, and pit school marketing slogans (or, in a pinch, school mottoes) against each other? **** Two words: George Mason.